AW Tillinghast's Brackenridge Park faithfully restored by John Colligan. Given the Lone Star State’s unofficial motto – ‘Bigger is Better’ – it perhaps shouldn’t come as too big a surprise to learn that four of its cities are listed among the 11 biggest in the United States. Folk in Washington State probably aren't too familiar with Texas and its metropolitan areas, so the fact San Antonio is actually the seventh largest in the nation shocks a lot of people up here. Not only is it bigger than Dallas which, since the days of JR Ewing and the hapless Cliff Barnes, has always been the place I associated with oversized everything - hats, cars, offices steaks, hair - it’s also significantly more populous than more recognizable cities like San Francisco, Detroit, Boston, Seattle, and Denver. What’s also a little unexpected perhaps is the variety and quality of the golf on offer. It might not be considered quite as well off for public courses as near neighbor Austin, but there’s more than enough good golf in San Antonio to fill a week. 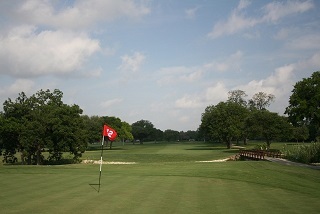 If magazine-friendly courses with gps-enabled carts and Nordstrom-like pro shops are your thing then you’ll find what you’re looking for at the Westin La Cantera, Hyatt Hill Country, TPC San Antonio, The Quarry, Briggs Ranch and one or two others, but if budget is your main consideration you have a number of options on the Alamo City Golf Trail, including what I reckon is the city’s most interesting and enjoyable round – Brackenridge Park. To be honest, if I had $120 in my pocket, I’d play this municipally-owned course twice rather than a flashier course once. Just two and a half miles from downtown and part of a 343-acre park donated to the city by banker, philanthropist, and Regent of the University of Texas (1886 to 1920) George Brackenridge, ‘Old Brack’ was designed by the great A.W. Tillinghast and opened in 1916. In 1968, the heathens in the City's road-planning department decided to take US 281 right through the back nine meaning ten acres were lost and sections of the San Antonio River that flowed through the course filled in. Parks and Rec employee George Hoffman and course manager Murray Brooks redesigned a shorter, and altogether less appealing back nine. Thankfully, the MGA saw the merit of Colligan’s proposal and gave him $7.5m to bring about the transformation. The river was reinstated, old bridges re-opened, and 15 of Tillinghast’s 18 holes revived, six of them with square greens that were quite popular during the early part of the 20th century. Brackenridge Park reopened on December 1st 2008 and drew praise from all corners. If you ever find yourself in San Antonio, don't leave without playing it.